Originally published under the title "Celebrity Prof Reza Aslan Bring His 'Islamophobia' Show To Penn." Reza Aslan wants people to understand that Islamic extremists are not so very different from the rest of us, and also to check out this human-brain-eating 'Hindu' on the pilot of his new TV show. What happens when a professor known for hyping the dangers of "Islamophobia" is accused of perpetuating such a "phobia" himself? 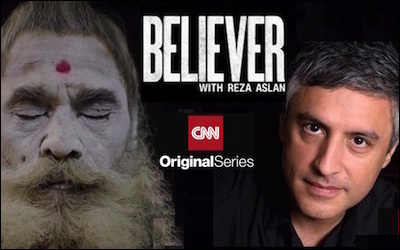 Critics of UC Riverside creative writing professor Reza Aslan's new CNN show, Believer, are charging him with "Hinduphobia" for depicting Hindus as cannibals in the opening episode. An Iranian-American academic, author, HBO producer, and now television host, Reza Aslan has become a sought-after speaker on Muslim life in America. His celebrity profile packed the house at the University of Pennsylvania last month for the presentation "Fear Inc.: Confronting Islamophobia in America." The crowd of approximately 750 was a diverse mix of students, attentive adults, and prominent Penn faculty and alumni, most notably NBC's Andrea Mitchell. The significance of the turnout was clear: fearmongering about rising "Islamophobia" is trending, and a young, hip Muslim-American with cable TV producing credentials has the answers. Fearmongering about rising 'Islamophobia' in the U.S. is trending. Aslan began by proclaiming American "Islamophobia" a recent phenomenon. An Iranian immigrant whose arrival in America coincided with the Iran hostage crisis, he claims to have witnessed little bigotry against Muslims. Even 9/11 sparked not a backlash, but a nationwide rallying cry to support Muslims. "If we are engaged in the war of ideas, we knew that the most powerful weapon in our arsenal were the three million Muslims that were here," he proclaimed. the thinking man's Islamophobe! He's the guy I worry about the most because his argument is pretty simple: it's not the jihadists and the terrorists that we need to worry about, it's the Muslim who is actually absorbed in American culture. Pipes never made such a claim and, far from encouraging fear of Muslims, has consistently proclaimed "radical Islam is the problem; moderate Islam is the solution." Aslan encouraged the audience to "laugh at these guys" and ostracize them as "fringe figures, hate group leaders . . . and people who have no business in the mainstream on any topic, much less Islamism." He even claimed that Trump doesn't believe Islam is a religion at all. 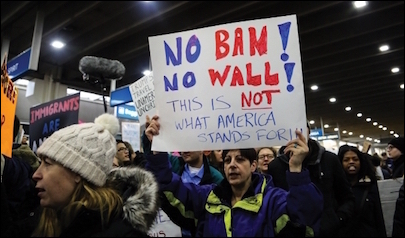 Reza Aslan's appearance in Philadelphia attracted throngs of anti-Trump protestors. A student asked about U.S. influence on the rise of Islamism, leading Aslan to point out that this is neither unique nor surprising. Religious nationalism is on the rise everywhere, especially in the U.S. and Israel, he maintained. Aslan brought up a Pew study to back up his contention that at least one third of the U.S. can be defined as Christian nationalists, and cited messianic Zionists and current Israeli Education Minister Naftali Bennet, who he called "the expected next prime minister," as Israeli examples. "What's important to understand is that [Islamism] is not a religious ideology, it's a political ideology," Aslan stressed. "As an ideology, it has very defined goals that are nationalistic." The U.S should only be concerned with those whose goals are "trans-nationalistic," he added. Islamist ideology is inherently religious and political. But of course, Islamism is inherently religious, not merely political, adhering as it does to the traditional tenets of Islam that do not allow for separation of church and state. Moreover, Aslan erroneously claimed that the Muslim Brotherhood and Hamas are nationalistic, whereas only al-Qaeda and ISIS are trans-nationalistic. Aslan insisted repeatedly that Islamists with nationalistic views are part of the worldwide trend exemplified by Brexit and the election of Trump, and should not be feared. That is, only jihadists like ISIS are distinguished by a "military element" and therefore pose a threat to Americans. His claim that the Muslim Brotherhood and Hamas are only interested in taking political control, respectively, of Egypt and the Palestinian territories is deeply inaccurate. The Muslim Brotherhood has always maintained trans-nationalistic goals, while Hamas has forged alliances with international jihadist groups and Islamist regimes. Aslan's claim that Hamas and the Muslim Brotherhood only seek political power is wrong. In emphasizing this "important distinction" Aslan sought two goals: downplaying the number of dangerous Islamist groups, and attacking the Trump administration for its anticipated plan to label the Muslim Brotherhood a terrorist organization. "We're in the midst of an administration that shows no difference between these two orientations," Aslan declared to gasps of outrage from the likeminded audience. "We have to stop jihadists, but to apply the same pressure to Islamists is disastrous. This is what leads to the kind of radicalization we are trying to reverse." To the untrained, sympathetic ears of the young audience, Aslan's absolutes about "Islamophobia" in American society appeared rational. His media and television platform makes him attractive to university audiences, but revering someone like Aslan is as nonsensical as claiming that Daniel Pipes and a few others created "Islamophobia." Aslan concluded by declaring "The most important thing I can say is that Islamophobia is really not about Islam. This is about a crisis of identity we are having in this country." As students experience this "crisis of identity," schools like Penn should be providing them with well-informed, unbiased scholars. Mere celebrity isn't enough.